The purveyors of connected smart home objects are convinced that smart home robots are the next big thing. For years now, they’ve infiltrated and surveilled — and in some cases, charmed — homeowners into adding their capabilities to the home. Amaryllo International’s Koova 2 is the sequel to the original while updating it with a few key additions. This new Koova2 doesn’t stray too far from the original’s small, portable form factor — going as far as still claiming it to be the world’s smallest. 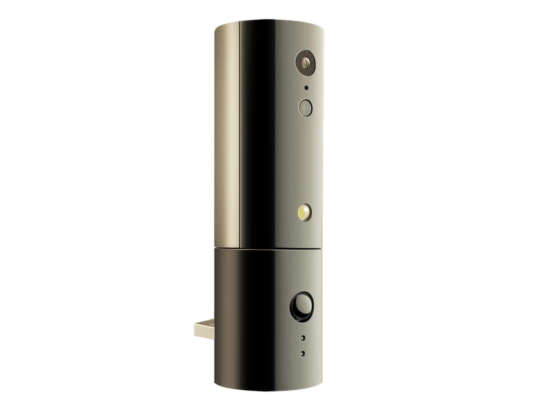 It packs a 240° viewing range with auto-tracking capabilities augmented with facial recognition and motion sensors for security purposes, along with a wide array of notifications and alerts to keep users in the know about their abode at all times. Now, two-way audio is added to interact with family and friends or scare off would-be burglars, while activity/block zones let user mark areas to receive/not receive alerts for. Koova2 also offers cloud storage for the video it continuously records, offering users 10-second video notifications and three-second video alerts that are all archived for review anytime. It can be connected directly to power or be charged for wireless use, sporting a USB port for power banks if the situation calls for it. Each Koova2 goes for $159, which comes with 8GB of onboard memory and a year of Gold-level cloud storage, which offers 30-days of unlimited storage, all of which normally retails for $299. Amaryllo International is looking to ship Koova2 by January 2017 should its Kickstarter campaign raise $1,000 by December 29th, 2016. The security robot segment is quite crowded. When comparing the incredibly tiny form factors of the Butterfleye and Spot, the reusable nature of the Presence smart camera and the charm of the roving Orbii to the Koova2, there’s suddenly nothing particularly impressive about it. While the Koova2 is mobile and powerful in its own right, it lacks something that hasn’t truly been seen before. When that true innovation happens, it’ll shine through.